We’ll hear about Butler’s historically poor shooting in this game, but UConn shot historically bad also. UConn had the worst field goal percentage for a winner of the national title game since the tournament expanded to 64 teams in 1985. There have been three other under .400 FG% games since 1985: Arkansas ’94, a poor shooting, but faced paced physical team; Kentucky ’96, Antoine Walker was a leader on that team, need I say more; and Arizona ’97, a very perimeter oriented team. UConn/Butler: Is the AP Poll Losing Predictability? This year’s NCAA tournament has been one of the most unpredictable in recent memory. VCU made it to the Final Four, and now UCONN and Butler are playing in the national title game after UCONN was unranked in the pre-season poll and Butler was unranked for all but the first two weeks of the season. This raises the question: how accurate are the AP polls, particularly the pre-season poll? 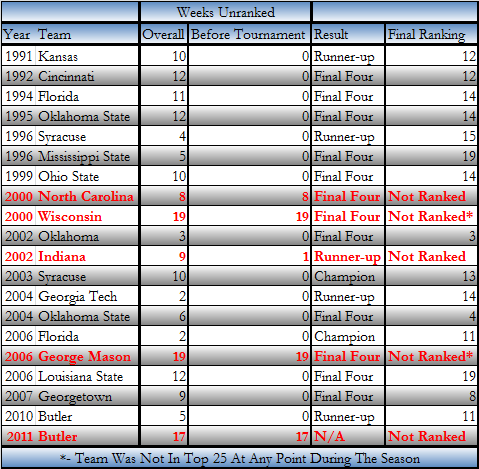 The table above shows how many of the teams in the pre-season Top 25 ended up being in the final Top 25, since the 1989-1990 season. This way of measuring the accuracy of polls is probably the most favorable to the pollsters. It does not take into account shifts within the top 25; that approach would certainly judged the pollsters in a more harsh manner. The pre-season polls reached the peak of their accuracy in during the 1999-2001 period and has reached its low during the current three-year period 2009-2011. The trend in polling accuracy was relatively consistent until around 2007, the same year as the start of the one-and-done rule. Before that rule, players that attended college usually stayed more than one year, allowing the pollsters to gain more familiarity and evaluate teams accordingly. Connecticut was unranked in this year‘s preseason poll, no doubt because it had a number of unknown players; pollsters did not know how to evaluate them. A VCU – Butler Final Four Matchup Will Be Historic. With their win over Kansas Sunday, VCU set up a Final Four game in which each team will have been unranked for at least 17 of 19 AP polls this season. VCU was unranked all year and Butler was unranked for all but the first two weeks of the season. There has been only 4 instances, since the Top-25 era began in 1989, where the two teams meeting in a Final Four game have been unranked at some point in the season. 2006 Florida was the only one to win the National Title, but they were only unranked for the first two weeks of the season. The Butler Did It: Butler Joins Some Rare Company On Its Way To The Final Four. With a win today against Florida, Butler joined a some rare company. They became the fifth unranked team to reach the Final Four since the Top 25 era started in 1989. The other four teams were UNC in 2000, Wisconsin in 2000, Indiana in 2002, and George Mason in 2006. Of those teams, only Indiana made it to the Championship Game, which is not too surprising when you look at the table below. Indiana was ranked up until one week before the tournament and was unranked for a smaller portion of the season than the other four teams. 2000 UNC was unranked for the last 8 weeks of the season, this year’s Butler was unranked for the last 17 weeks of the season, and amazingly; 2006 George Mason and 2000 Wisconsin were unranked for the entire season. There were also 15 other teams who made the Final Four while being unranked at some point in the season, but they were ranked by the time the tournament started. “Weeks Unranked” Before Tournament is How Many Consecutive Weeks Unranked Before Tournament. Let’s look at each instance individually. As stated earlier, this season’s Butler team was unranked for the last 17 weeks of the season. Their run is not as improbable as it seems when you look at their body of work. Their absence from the Top 25 had more to do with the poll voters overlooking them than their actual play. While they did have a three-game hiccup in conference play, they still had good conference and non-conference records. One would think that last year’s run would have given them some benefit of the doubt with the voters. They were undoubtedly overlooked because they lost Gordon Hayward to the NBA and bias against the mid-major conferences. The 2000 Tarheels had sufficient talent to make the Final Four and they displayed that talent during their 9-4 run through their early non-conference schedule. But when they got into conference play they began to struggle and dropped from the top 25 for good when they lost 4 conference games in a row, the last being to a weak Florida State team. A good showing in the ACC tournament would have probably gotten them back in the Top 25, but they lost in the first round to Wake Forest. When they hit the NCAA tournament as 8th seed their talent began to gel and they got lucky when Kenyon Martin got injured and the 2nd seed Cincinnati lost in the 2nd round to Tulsa. Bottom Line: Their ranking, or lack thereof, said they shouldn’t have made the Final Four, but their talent warranted their “surprise run”. The 2000 Badgers stayed unranked the entire season and I can’t really explain their run; except to say that their slow-paced, defense first style, combined with some luck, helped them a great deal during the tournament. George Mason in 2006 also had a inexplicable run to the Final Four; it was a true Cinderella story. If the last 20 years is any guide, Butler should probably lose in the Final Four, but if recent history and common sense prevail, you can expect them to at least get to the title game.